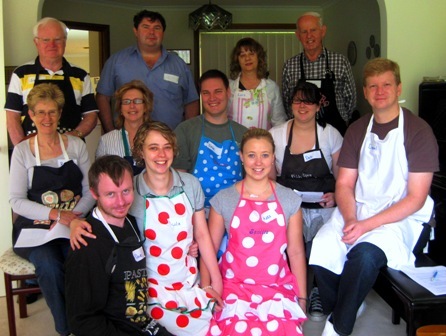 Here’s our crew from last Saturday’s cookery class in Australia’s National capital Canberra. The event: a birthday bash for Nicola, in red-dotted apron. It was a very character-driven culinary adventure. The men, headed by Dave (front, in black) husband of Nicola were super-enthusiastic. The ebullient Kara, sister of Nicola in pink apron with white dots, added extreme comedy relief of top-quality quirky-sitcom standard. All meant in the nicest possible way, Kara. The home kitchen and lovely aromatic patio garden bedecked with heavenly star jasmine was courtesy of Dave’s Dad Jim (back left). The food we cooked was tasty and plentiful, the company cordial, the weather conducive. What more could you ask for my last cookery event for 2010. What a year! Adios amigos.